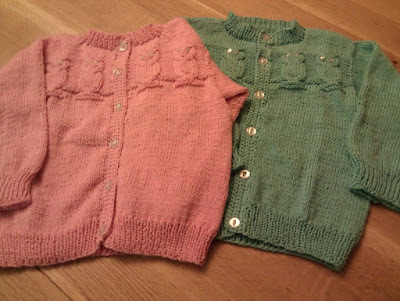 Posting pictures of sweaters knit for twins when one is pregnant could be taken the wrong way, so I need to be very clear...I am having one baby! This is an order that finally got finished. The blue doesn't show true to its shade in this picture, it's actually the classic "robin egg blue" one pictures for '50s boy baby showers. I was having tons of camera trouble tonight though, so I was grateful to get a shot at all. We did have our first midwife appointment today and I got assured that everything's just how it should be at 11 weeks. We even got to hear Sprout's heart beat on the doppler before he/she wiggled away. This are beautiful. I can't wait to see all the wonderful things you make for your own wee one! And hopefully I'll make it out there to see the wee one before it isn't actually wee anymore.